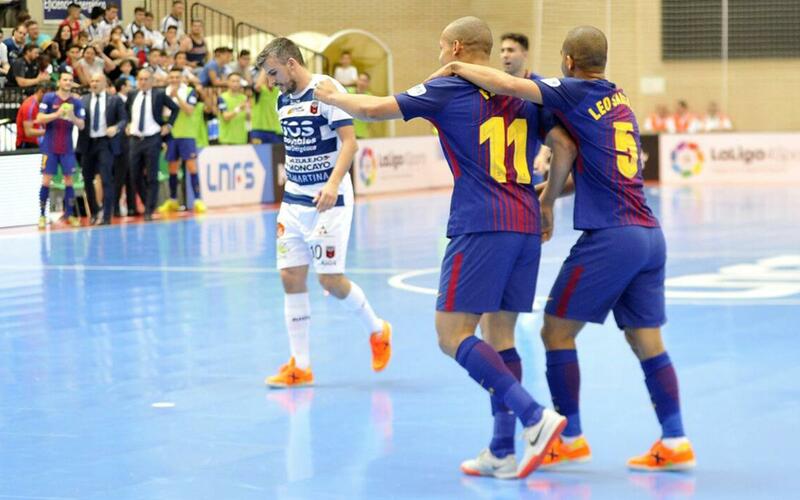 The playoffs of the LNFS have begun with a victory for FC Barcelona in the first game of the quarter-final series - best of three - against Zaragoza (1-4). The win gives Barça the advantage and an option to qualify for the semifinals on Tuesday at the Palau Blaugrana. Ferrao's double and goals by Sergio Lozano and Joselito were decisive. In fact, the Brazilian pivot was the star player in Andreu Plaza’s side. He started very well and tested the reactions of the home goalkeeper. Joselito hit the crossbar, and Esquerdinha, with a header, also went close. When Ferrao stole the ball, he combined with Adolfo and ended up scoring the first goal (0-1, min 13). Just three minutes later, a good goal by Richi Felipe levelled the tie (1-1, min 16). It was in the second half when Ivan Bernad kept his team alive, especially once Barça gained more momentum. However, he was powerless to stop Ferrao’s second (min 23). Barça were superior, but had difficulty in extending the scoreline. Retamar’s sending off was crucial as first Sergio Lozano (1-3 min 35), and then Joselito (1-4 min 38), ensured the visitors to head back to Barcelona dreaming of the semifinals.